Performance of Eagle Squadron by Kenneth Alford, ed. 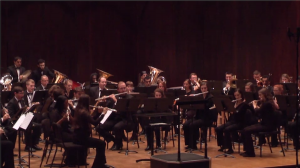 Rogers by the Ohio State Symphonic Band on October 8, 2014 in Weigel Auditorium. Posted by Scott Jones at 2:42pm December 9, 2014 Posted in 2. Eagle Squadron by Kenneth Alford and tagged 2. Eagle Squadron by Kenneth Alford. Bookmark the permalink.